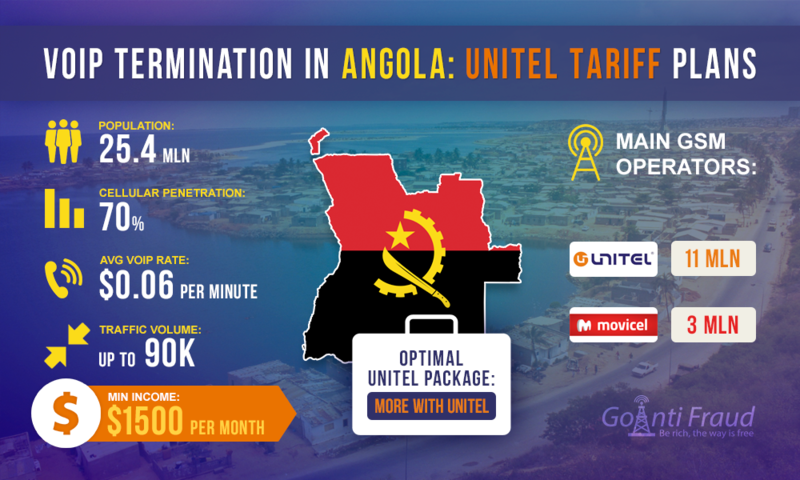 Unitel is the largest and "oldest" GSM-operator in Angola, competing with Movicel. Those, who plan to invest in the voip over gsm business, should pay close attention to Unitel. With a population of 25.4 million people, mobile penetration reaches 70% in the country (approximately 17.7 million connections). Over 11 million subscribers use services provided by Unitel, which ensures a market coverage of 80%. As the most popular cellular provider, the company provides huge amounts of traffic daily. Using Unitel SIM-cards and equipment of the best gsm gateway category, you can get the maximum profit, thanks to landing the maximum number of international calls at local rates. With an average cost of one voip minute being about $0.06, transit companies offer 90 K traffic to terminate on a daily basis. To organize the voice over gsm business in Angola, you need to take care of SIM-cards. Both the numbers and the tariff plans to make calls are important for successful termination. The lower the value of a local call is, the more you can earn on the difference of international calls. You can buy a prepaid Unitel SIM-card at the company store, while cards for topping up can be purchased from any street vendor. Since January 2014 in Angola the government decree has been in force stipulating that all prepaid numbers should be registered. If you do not register your SIM card, it will not be active. To perform this procedure, you must have a passport with a valid visa. Since 2016, cards can be bought exclusively in Unitel stores, although earlier prepaid starter packages were sold on the streets. The online procedure of registration is also available. One SIM-card of the operator costs $5.45. On average, the number will remain active for 5 days, until it the antifraud system blocks it. Accordingly, when using an 8-channel gateway, your business expenses on SIM-cards will be about $180. In Angola, the telecommunications companies charge their services on certain conditions. Tariffs are calculated in the UTT, which is a conditional monetary unit that is common to all operators. One UTT is 7.2 Angolan kwanzas, i.e. $0.044. Basic. The first minute costs $0.13 if you call Unitel numbers, after you have talked 1 minute, the tariff is $0.11. "More with Unitel". The first minute of the call will cost 15 cents, but the following $0.04. "More Time". Cost per minute is 15 cents, but the subscriber gets $0.0044 bonuses for every minute, receiving incoming calls. The best option for the terminator is the "More f with Unitel" tariff plan. Terminating for 5 hours a day via 8-channel gateway, you can make about $800 a month. The more multi-channel equipment you install in the Angolan cities, the greater your income will be.